Born Eileen Scott she worked in the offices at Horwich Loco Works until 1952 when she married Gordon Kay, who had a butcher's shop in Chorley New Road, Horwich. 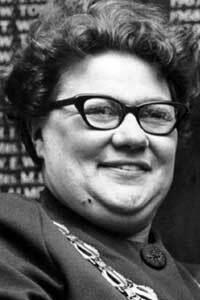 She was the first female Liberal to be elected to Horwich Urban District Council in 1966. She was known as a hard working Councillor who devoted herself to the community, helping elderly people and organizing the town's meals-on-wheels service. When she became Chairman her pledge was to "...endeavour to further the cause of Horwich wherever I go." Chairman of the Highways and Road Safety Committees. Member of the Divisional Education Executive. Her Consort as Mayor was her husband, Gordon. President of Horwich Chamber of Trade. Secretary of Horwich Carnival Committee for 11 years.